Also: outstanding undergrads had their time in the spotlight during Student Achievement Week. 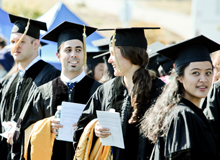 A highly employable Banana Slug: We asked UCSC students to make videos explaining why they should be hired. See the winner of our Hire Education contest. Watch video. 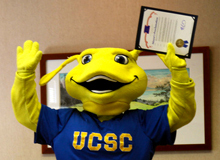 Tell us what it means to be 100% Banana Slug. Use photos, video, quotes, prose, haiku, or whatever strikes your fancy!